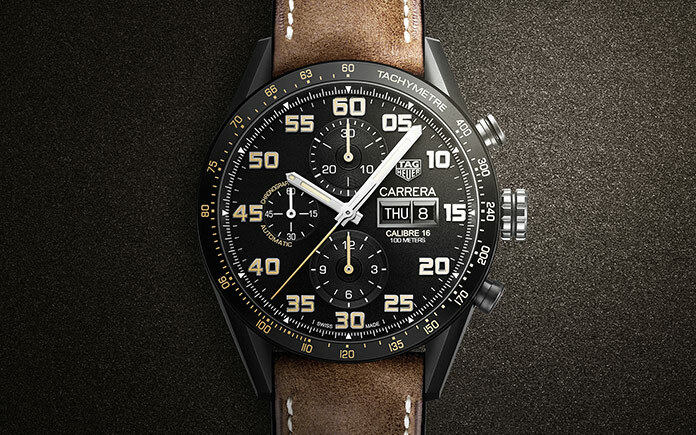 To celebrate its 10th anniversary, the celebrated TAG Heuer Chronograph Carrera Calibre 16 has been given a major face-lift: now available in a lighter version thanks to the use of titanium, it is contemporary and elegant in matte black with beige detailing, and paired with a distressed brown leather strap that is sure to please the modern hipster. 10 years! This sporty watch, 43 mm in diameter and launched in 2007, is TAG Heuer’s best seller and one of the brand’s iconic models. In 2017, the renowned chronograph has been updated in celebration of its anniversary. Firstly, it is now available in titanium, a decidedly modern and lightweight material, appearing here in Grade 2 micro-blasted black PVD titanium, giving the case an elegant and modern look, framed with a black ceramic bezel and beige tachymeter scale. Various details echo the style of the 60s Carrera: the wide dial opening and its fine bezel, the two chronograph counters located at 6 and 12 o’clock with their applied rings, and finally the faceted lugs that featured on the original Carrera models. Other distinctive features: the minute counter with Arabic numerals in applied black gold with beige SuperLuminova, the clearly visible Day and Date window at 3 o’clock and the small seconds counter that balances the dial’s overall appearance at 9 o’clock. On the back, the sapphire case back displays the beautiful mechanics of the automatic Calibre 16 movement as well as the weight, decorated with a Côtes de Genève pattern. The watch is finished with an on-trend distressed calfskin strap that will age beautifully. This watch is bound to appeal to the modern hipster.